This salmon dish is easy, quick and delicious. The hollandaise sauce adds a richness to the meal. Serve with asparagus for a healthy, satisfying meal. To make the sauce, gently mix the mayonnaise with the whipped cream and lemon juice in a bowl. Place in the fridge to keep cool. Season the salmon with salt and white pepper and cook under the grill for 6 to 8 minutes, until cooked through and opaque. 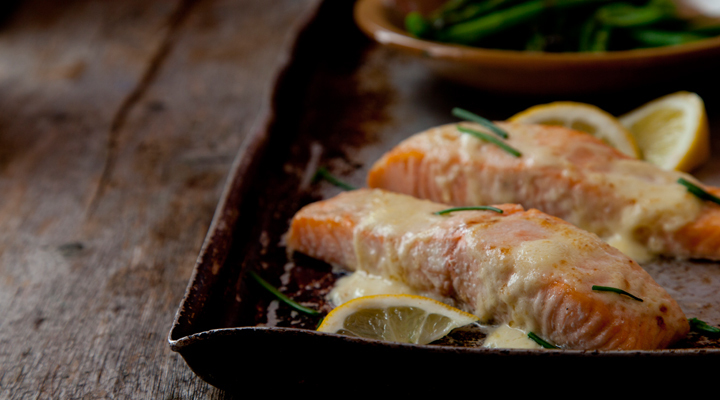 Remove the salmon from the grill and spoon over the sauce. Garnish with the chopped chives and serve with steamed asparagus. If you want to cook the salmon on the barbecue, make sure the barbecue grill itself is good and hot so the fish seals and doesn’t stick to it. Season the fish well and rub both sides with olive oil. Place on the hot barbecue and cook for 3 to 4 minutes on each side. Alternatively, you could wrap the fillets in a tin foil parcel with a little butter, seasoning and some fresh herbs, then pop it on the barbecue for 6 to 8 minutes. If you’re watching your saturated fat intake, you could use low-fat cream and low-fat mayo.